Sometimes living with dementia can cause various hurdles- one of which can be eating out with family and friends in restaurants and cafes. 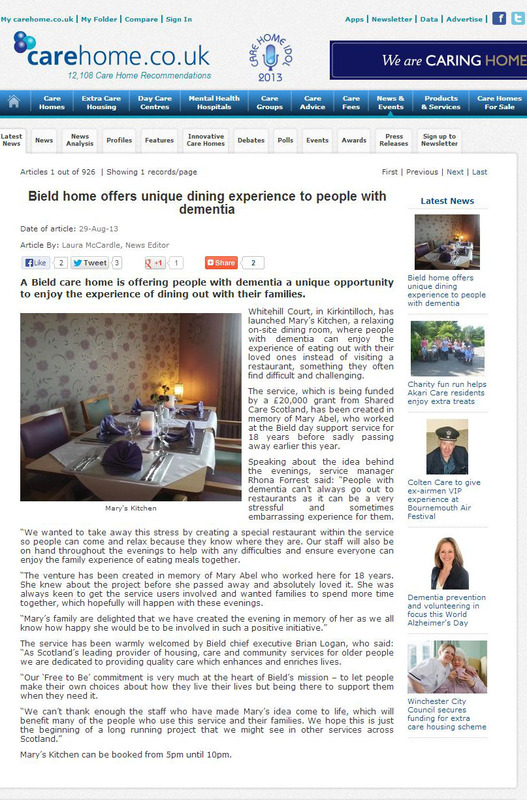 This is why staff at Bield’s Whitehill Court have come up with a new “Come Dine with Me” evening service. The service is designed to help people with dementia enjoy sitting round a table with friends and family in a safe and friendly environment with staff on hand to help throughout the evening if needed. Created in memory of Mary Abel who worked at the Bield day support service for 18 years as an assistant manager, the evenings will take place once a month and is available to any service user. This inspiring story cooked up a host of headlines featuring in The Evening Times, Care Industry News and Care Home online . You can see the original press release here. If you want help targeting a particular audience and to tell your stories, get in touch now.